Volunteers Lassie Smith, Gloria Kennedy, Kay Stephenson, Traci Long and Youth Volunteer Jillian Long worked “The Chili ‘N Dogs Fall Festival” at the Church of the Apostles, Saturday, October 3 in Coppell. Love Thy Baby volunteers made baby blankets, pet beds and pet toys available for a donation. Proceeds and beds were donated to shelters after the event. 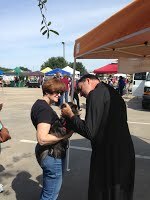 Father Tim from the church blessed each pet individually. It was a gorgeous day in every way – already planning next year! What began as a casual recycling effort has turned into an on-going program for Love Thy Neighbor. tearing off selvage, and trimming blankets, hats and booties. We started donating these scraps to a local volunteer who used them for dog bed stuffing for Operation Kindness. LTB volunteers loved the idea of recycling versus throwing out and started bringing in their scraps from home too. Soon the amount we were collecting far exceeded the quantity that could be used by the Operation Kindness volunteer. 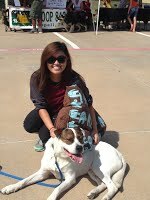 So LTB volunteers began making dog/cat beds too and Love Thy Pet was born!